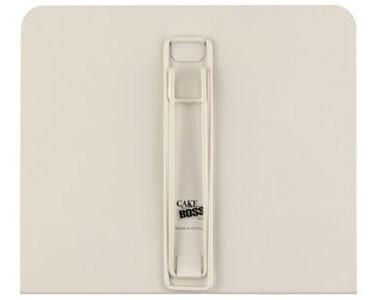 Keep hands free for more enjoyable baking and decorating by propping up cookbooks and even electronic devices on this stylish Cake Boss Countertop Accessories Metal Cookbook Stand with in. in. 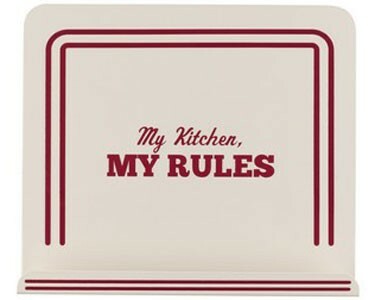 My Kitchen, My Rules” Decal. With its lively retro design, this metal cookbook stand makes consulting your favorite print and digital kitchen literature fun and easy. The metal stand is crafted from durable tin that is protectively coated to help resist warping and rusting. 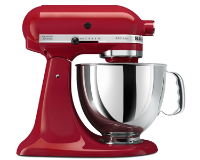 The height and width of the back surface provide ample support for books, recipes or decorating guides and the wire legs lock securely for stability. A deep, generous lip wraps up and around the bottom edge of reading materials to hold pages and portable reading devices in place. 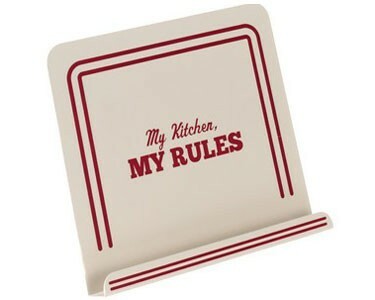 The metal cookbook stand features a playful “My Kitchen, My Rules” decal in retro-red against a cream-colored background for a great, old-school statement on the home kitchen or bakeshop countertop.